What a peculiar feeling watching your own national team being shredded to pieces and not really feeling upset about it. This sums up what, I suppose, everyone else was feeling on the aftermath of a rather humbling 1-6 defeat of the Azkals by the visiting LA Galaxy in what the marketing people dubbed the Dream Cup. The dream part, I suppose, was having David Beckham’s Adidas-shod feet actually stepping on Philippine soil; although admittedly, the iconic midfielder is at the twilight of a celebrated career. For a generation that grew up when cable television’s popularity surged in the country – also coincidentally the Manchester United era – the arrival of Beckham was something akin to Zeus stepping down from Olympus. Throw in the well-travelled tandem of Ireland’s Robbie Keane and America’s Landon Donovan – along with a merry mixture of fading and emerging American internationals – and yes, for a country that is as yet ignored by English Premiership clubs, the LA Galaxy for the meantime falls very much in the category of dreams. Thus, it was only appropriate that Beckham himself should score the opening goal last night. The script, if there was one, could not have been written better. A cross from the left was played back down the middle in the 19th minute. Beckham, arriving late from deep in midfield, spotted Philippines goalkeeper Eduard Sacapaño well off his line and curled a trademark chip over Sacapaño and into the net. Earlier, the Galaxy was playing no more than diplomatic football, shuffling the ball about the pitch as though on training ground keep-ball drills. The Azkals, to be fair, were not as starstruck as one would have predicted. They had their own share of possession and Manny Ott, in the 12th minute, forced a save by the Galaxy goalkeeper after receiving the ball just top of the box and shooting on the turn. 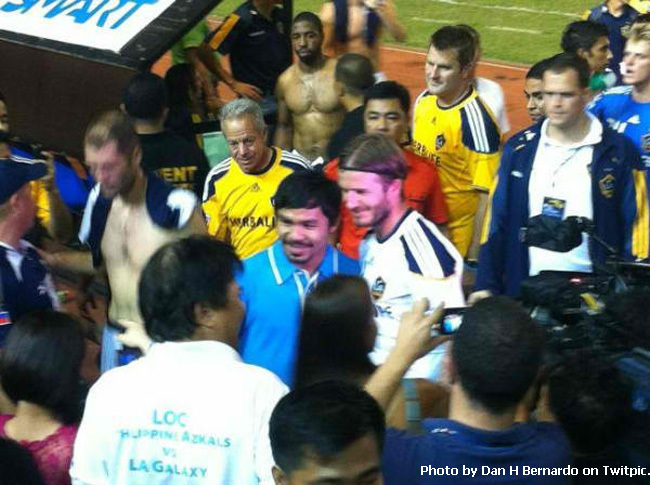 In fact, after Beckham’s opener, the Azkals were creating more chances. Phil Younghusband blazed a shot over in the 22nd minute; followed by attempts by the diminutive Chieffy Caligdong in the 23rd and 29th minutes. Shots, however, do not count. Goals do. It was in this department that the professionals from Los Angeles, with their vast experience, had the edge. In the 38th minute, Donovan unselfishly laid on a ball for Mike Magee for the Galaxy’s second goal, the play almost a mirror of the opener. Just two minutes later, though, the Galaxy switched off in defence. A ball found Phil Younghusband right side of the penalty box. Younghusband had earlier been doing a great impersonation of Jonny Wilkinson by blazing his shots well over. This time, he turned the ball inside to his left foot and curled a shot into the net. In retrospect, perhaps Younghusband’s goal put an end to the football diplomacy. The Galaxy came out of the dugout for the second half with greater purpose and played with so much more urgency. Still, the Galaxy’s third goal in the 46th minute had the stench very much of a non-goal to it. Beckham played a corner deep from the left and the ball suspiciously appeared to have gone out of play when it was sent back to the middle. The Azkals’ defence thought as much and switched off. Keane tapped the ball in, thank you very much. The Azkals protested but to no avail; and it was pretty much downhill for the Filipinos from the third goal on. Heads dropped, legs grew weary, spaces opened up and the Galaxy – freshened up by quality players coming off the bench – turned on the screw even more. Two goals by Adam Cristman and a penalty by former American international Gregg Berhalter added gloss to the Galaxy’s victory that was, perhaps, spoiled by the contentious non-call that led to Keane’s goal. Still, only the most optimistic among Azkals fans would have predicted a win over the Galaxy who were, in the end, totally deserving of the win. Philippines coach Michael Weiss, interviewed after the match, could barely contain his irritation at his side’s defenders for their “lack of discipline” in staying back. On the other hand I can suggest, perhaps, that that was entirely up to him. There were local-born defenders on the bench who, I suspect, would have gladly stayed back for him. Since this was no more than an exhibition match, there was everything to gain and nothing to lose whatever the score was in giving the youngsters a taste of the floodlights. In the end, though, I would not read too much into the result. Rob Gier, the Azkals’ only recognized central defender who flew all the way from the UK just to participate, was regrettably injured inside 10 minutes and had to be substituted. Despite the scoreline, I thought Sacapaño did an excellent job and could not be faulted for any of the goals. Still, he is not Neil Etheridge; and the latter will be on the bench tomorrow night for Liverpool’s visit to Craven Cottage for an English Premiership match. It is also difficult to be analytical or even critical of our team’s performance because the Galaxy is a club side and its players train together day in and day out. Naturally, they played like a well-oiled machine. In contrast, our players were plucked from different clubs; and others even had to plane in specifically for the occasion. There was also the little matter of the Galaxy being fully professional, something none of the Azkals on the pitch could boast of. The Galaxy also substituted at will; and with its strength in depth, the quality of its play was never compromised. On the other hand, the more substitutes we sent in, the more mediocre our play became. Not counting, of course, my favourite thug Jason de Jong. The Fil-Dutchman left his stud marks on Keane’s leg to my utter glee. I also thought OJ Clariño gave a good account of himself. In spite of our shortcomings, our team actually gave an excellent account of itself, the second half notwithstanding. Truth be told, last night’s match was an occasion to be celebratory rather than critical; and both the result and the score mattered the least. Who would have thought a year ago that a Major League Soccer champion team would be playing in a packed Rizal Memorial? Fittingly, last night’s game was just two days short of the anniversary of our historic 2-nil win over Vietnam in the 2010 AFF Suzuki Cup. Somebody in the stands raised a placard that said “Man United Next.” And Liverpool... And Real Madrid... And Barcelona... And Bayern München... Who knows? Last night was just the beginning. In truth, last night was all about a dream coming true for many Filipinos. And not just Filipinos. Wasn’t that Beckham himself handing his shirt over and having his picture taken beside this small, bearded and muscular Filipino? Oh yes... Manny Pacquiao.